Fabric is the new leather! Hey my fellow bloggers, sorry I haven’t blogged sooner – my bad! Recently, I have been to the Interiors UK 2013 exhibition at Birmingham NEC. I was amazed at the turn out, and the furniture is out of this world. I did however notice one thing, not only if fabric the new black, but fabric is the new leather – or so it seems! Fabric beds were everywhere, and we love them. Fabric beds are available in many different colours. Birlea Furniture has introduced an amazing range of fabric beds, such as the Birlea Brooklyn fabric bed which is available in chocolate brown, grey or wheat. The thing we like most about the Birlea Brooklyn Collection is that it is also available as an ottoman storage bed, which is perfect for any room lacking in storage. 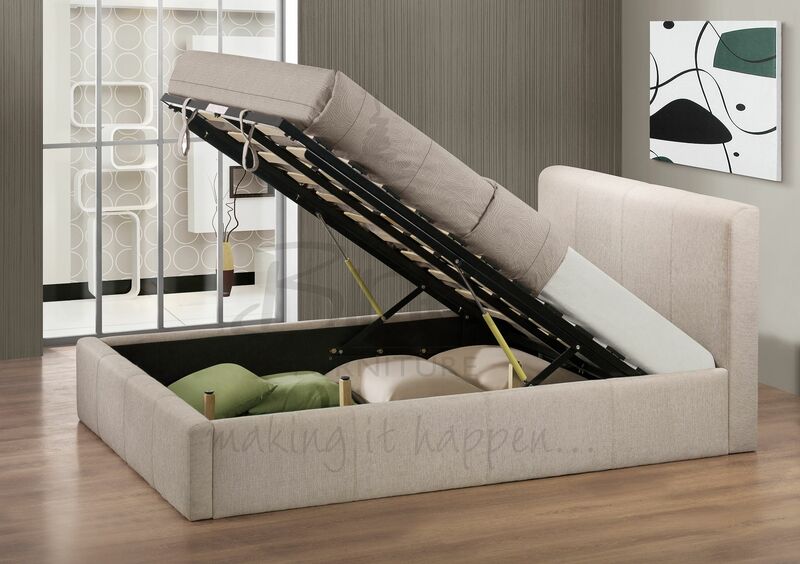 Currently I have only seen these particular beds available from leading bed stores such as Bed Centre UK and Bed SOS, but we’re sure other retailers will soon sharp jump on the fabric bed band wagon. Other manufacturer’s, such as Limelight Beds, have introduced some very modern fabric beds. Our favourite is most definitely the Limelight Eclipse fabric bed in plum finish. This Limelight Jupiter bed is another favourite of ours, with its beige upholstered fabric finish and easy lift up action for the internal storage facility. Time Living is another fine example of a fantastic manufacturer of fabric beds. Their range of Hamburg fabric beds are desirable, and come in a choice of pebble grey fabric or cocoa brown fabric finish. Here at Home Desirable, we just love the fact that contemporary fabric beds are becoming the latest must have piece of bedroom furniture. So guys, I mentioned about that porcelain candle holder. Well, I just couldn’t wait to share pics with you all. I love the design on the front, with the personal (to me) letter ‘E’ which is so stunningly visible. 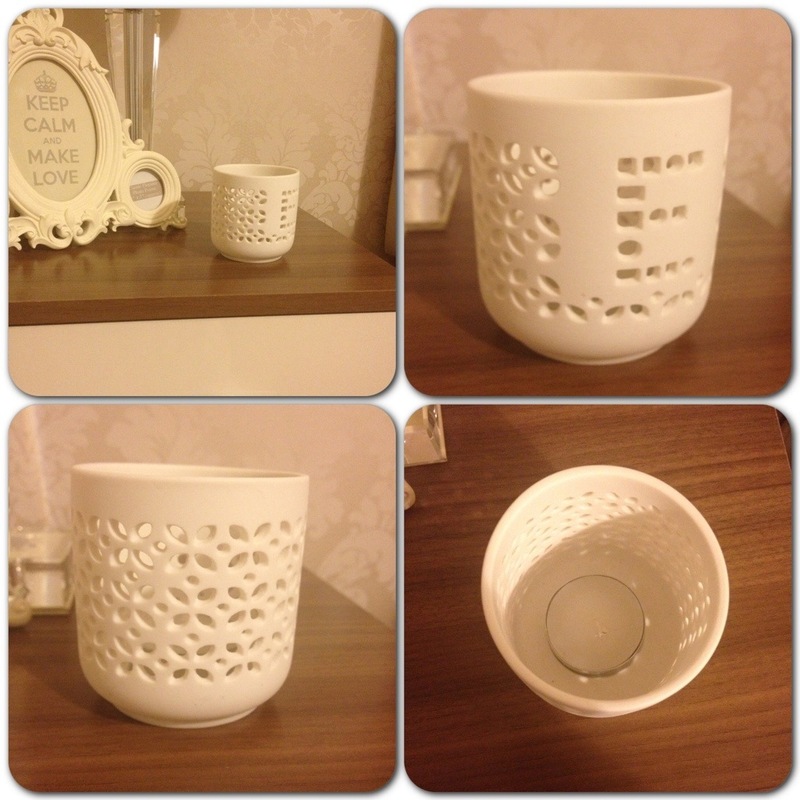 The detail to the porcelain candle holder is apparent all the way around. 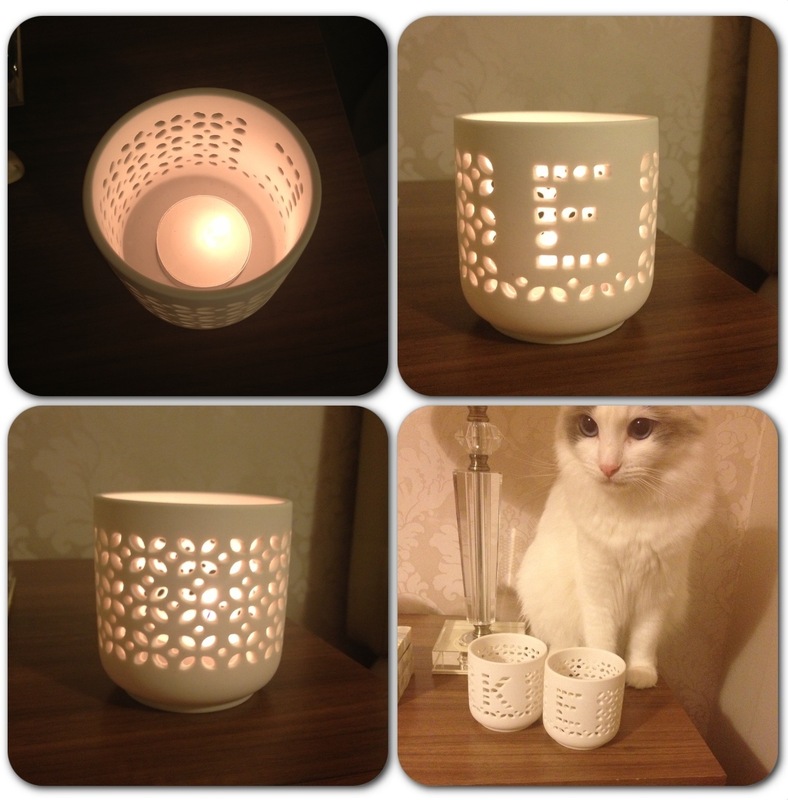 We love the circular design, with the desirable cut out detailing which glows stunningly. What do you think? Doesn’t it look beautiful? Wouldn’t you agree that this was a very thoughtful Christmas gift? Remember that ivory faux suede headboard we bought? Well, as I mentioned previously, when it arrived it was not ivory in colour and it certainly wasn’t faux suede. Basically, it just had to go! We have purchased many products from Bed SOS in the past, so we thought we would search for a 5ft cream headboard from Bed SOS. We were not disappointed! 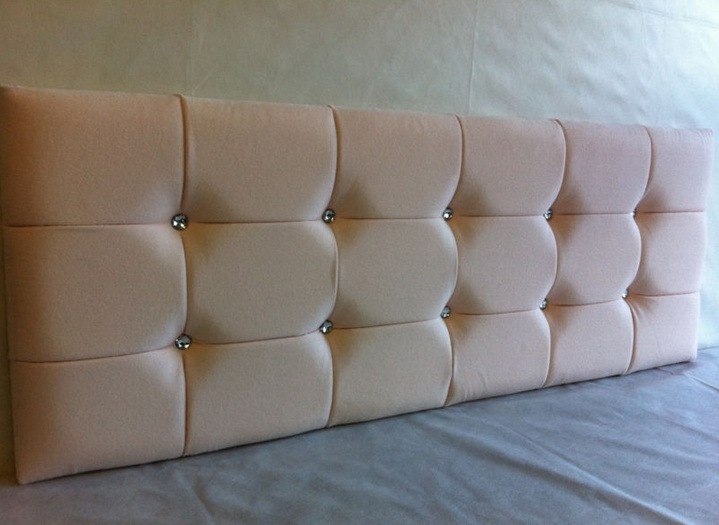 We opted for the 5ft king size Cambridge headboard, in cream faux leather finish. This headboard came with free next day delivery, or alternatively we could of opted for a specific delivery date if we wished. 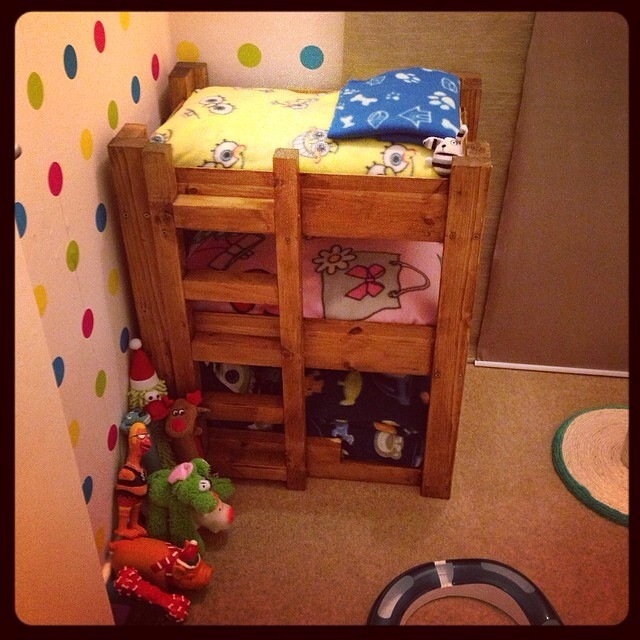 Bed SOS also deliver on a Saturday at an additional cost of £20.00, but that wasn’t necessary. Anyways, when the headboard arrived, we were very impressed! The Cambridge 5ft cream headboard is manufactured to a very high standard and comes from the Sleepy Valley Beds Collection. Doesn’t it look beautiful!? When we unboxed the headboard, it was covered in a white fibre protection bag, which acted like a dust sheet and also offered slight protection against any damage whilst in transit – even Angel from itsapussycatslife was impressed! The headboard was packaged securely, and came complete with easy to attach wooden headboard fixing struts. The struts are of far better quality than the ones included with our previous headboard. They are thicker, better finish/ quality and far more sturdy. The struts were also extremely easy to attach. The pack included x6 bolts and x6 washer rings, three for each strut, as well as the appropriate allen key. 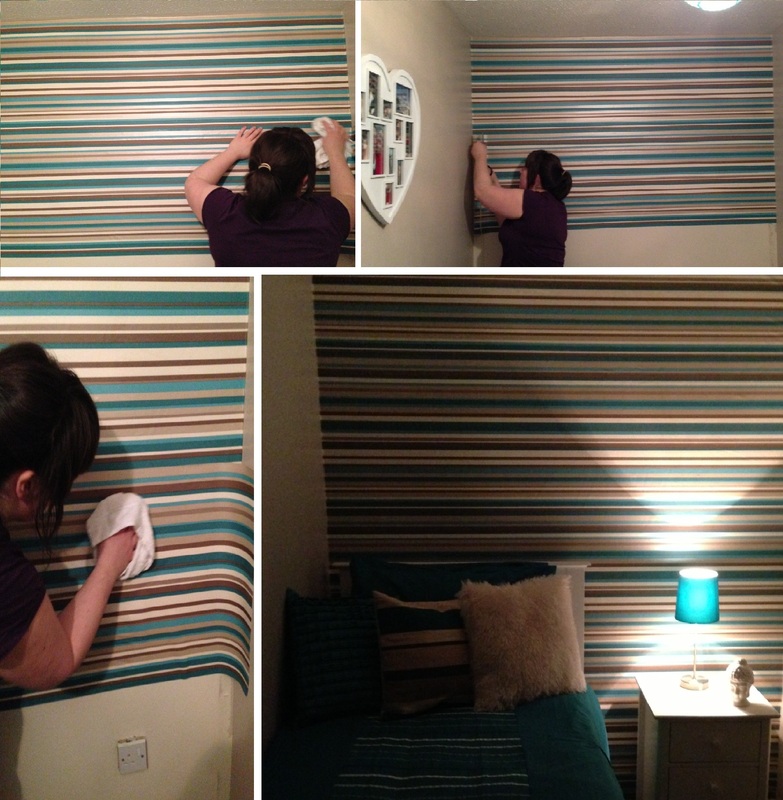 The headboard took around ten minutes to assemble, and fixed to our 5ft divan king size bed without any problem. Over all, we are extremely happy with the colour, style, quality and over all finish of our new headboard. What do you think? Is anyone else as impressed as us with the Sleepy Valley Cambridge headboard? Don’t forget to like, comment and share! After watching Channel 4’s Double Your House for Half the Money episode 2, presented by Sarah Beeny, I fell in love with the Croft-Baker’s home. This house features one of the most luxurious finishes Home Desirable has ever seen on TV. 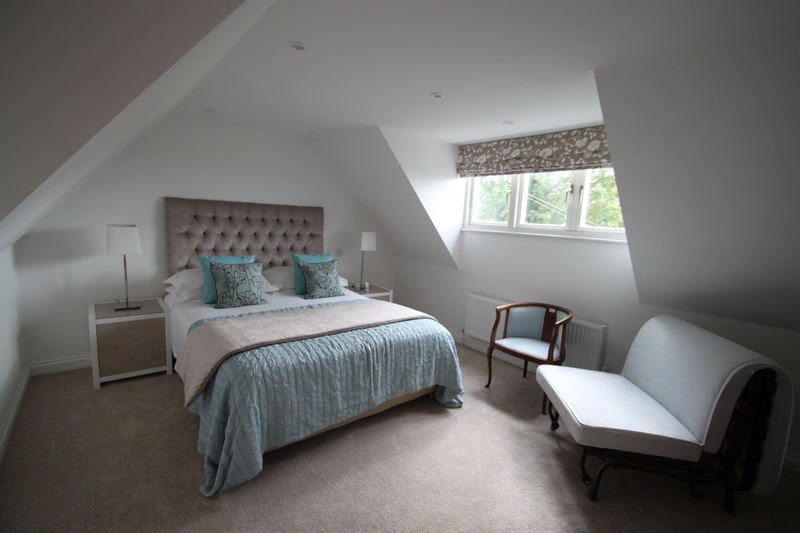 The master bedroom is breath taking, with its combination of light greys and duck egg blue. We love the use of colour and those luxurious blinds. Double Your Home for Half the Money have even surprised the kids with a fantastic bedroom makeover, whilst in the rear garden they have offered every kids dream – their very own slide! 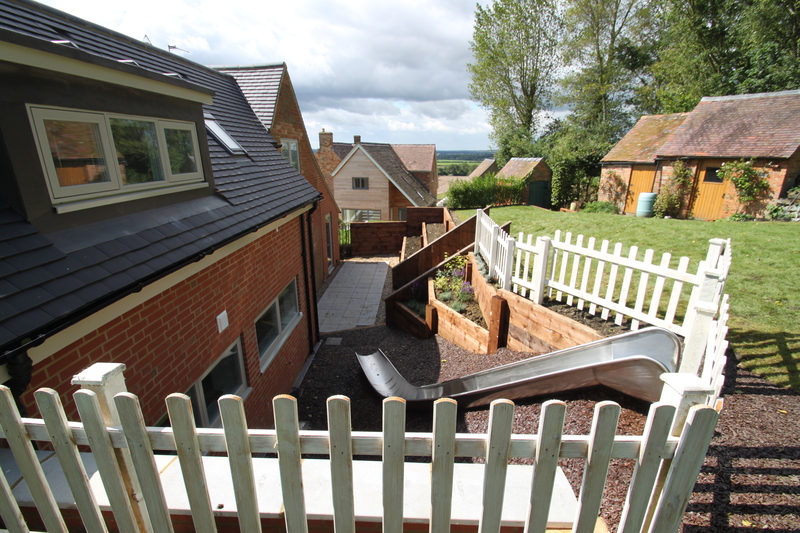 This garden is fantastic with its lawn area, wooden fencing and children’s slide, we just love it. 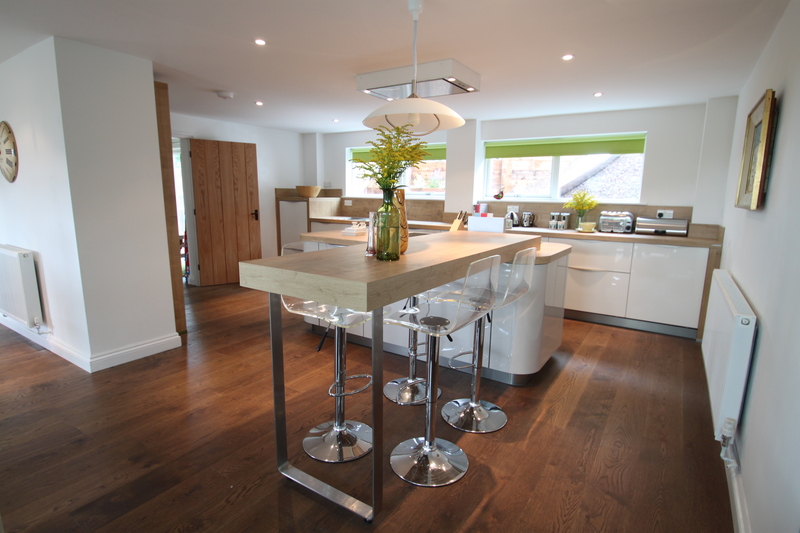 The kitchen is fantastic with its white gloss finish doors, wooden work bench area and use of bold green colour. The transparent bar stools are a big hit with us. 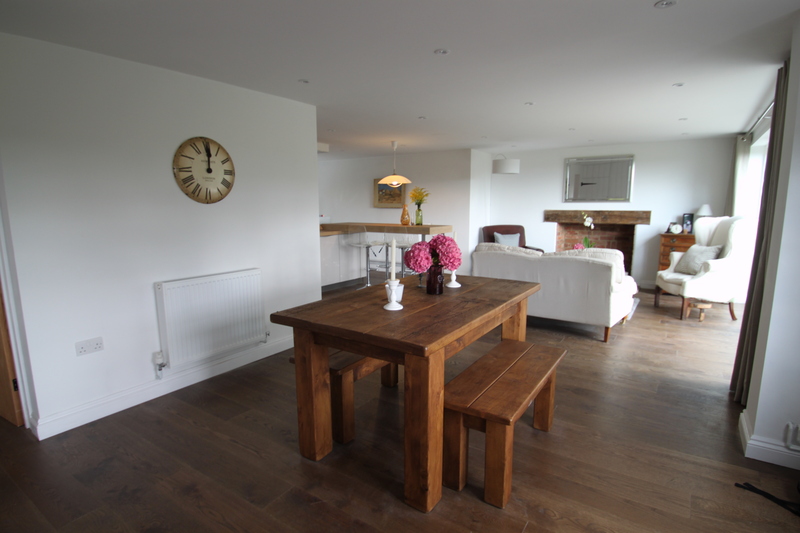 We especially love the open plan kind of feel to the kitchen, dining and lounge area. The light pouring in through those patio doors makes this room a relaxing place in our opinion. What do you guys think to the over all design of this property? Has this place inspired you to treat your kids to a must have garden slide? Feel free to post comments below. Top 10 things before renting a home! As you all know, Kelly and I have been desperate to move from our rented accommodation. If you’re in our shoes and are thinking about renting a new (or old) home, our list of “Top 10 Things to Think about Before Renting a Home” can help to get your search off to the right start. Whilst the number of bedrooms, condition of the kitchen and bathroom, and size of the yard are important, there are other key things to consider before you start renting a property. For us, this is the deciding factor on any property we rent in the future. You can live with practically any imperfection in a home if you love the neighbourhood and your neighbours. I mean you can change almost everything else, whether it is with a lick of paint or new carpets. But, once rented, you can not change your home’s location – unless you’re willing to pay out in admin fees again! When you go rented house hunting, consider any potential home’s proximity to your work, the neighbourhood, how the home is situated on the plot, ease of access, noise from neighbours, traffic, crime statistics, and access to local shopping amenities, schools, and public transport. Beyond location look at the particular site of the home. If the home is on a main road, will this cause a problem getting your car off your drive? Do neighbours windows appear to look directly in to the potential home? If there is a garden, is the garden suitable for children, pets, gardening, and other uses? Is the access to the property safe – i.e driveway elevation, stairs up to (if any) the front door? If your like Kelly and I, and have had a really bad experience with noisy neighbours, make sure the neighbourhood meets your expectations, not just the home – after all, what will your visitors think, first impressions count! A good idea is to check out potential neighbourhoods on a week night and especially on weekends – as weekends are renowned for neighbours partying etc. Also, seen as I have OCD, it’s a good idea to consider if the neighbours gardens and driveways are well kept – who wants to be living next to a scrap yard?! Another thing to consider is if the neighbourhood is safe enough for people to walk, run, or bike around. The appearance of your home says a lot about you – whether it’s rented or not. Your home should reflect your lifestyle. If you live a laid back life then you may not wish to live in an old formal Victorian style home – most probably you want something simple and modern, with all the modern luxuries. Take in to consideration the exterior of the property – a brick home is easier to maintain than a pebble dashed home (which from my experience leaves pebble dashing on your front door step every morning, resulting in the must have investment of a quality broom!) Also, consider the roof – is it in good condition. Is the landscaping attractive and are the sidewalks leading to the home safe? You may walk in to a potential rent property and think WOW this is amazing, but have you considered the size of the living area and floor plan – is it capable of fitting your sofa in? 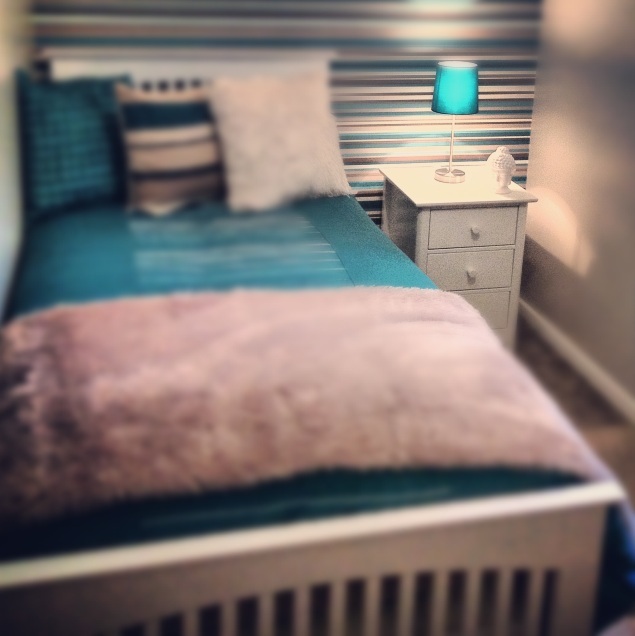 Are the bedrooms big enough for that king size bed (if you have one)! Also, consider if it has an en-suite with a bath and over bath shower, do you really need the luxury of an en-suite of this size when the main bathroom is adequate – added luxuries like these cause more cleaning! A large home can give you that all important extra space you’ve always wanted – but remember, you’ll pay higher heating bills and have higher taxes. Also, such a property will take more furniture to furnish and money to decorate. The best way to consider the size and floor plan is to think about how the new home space will be used and whether it will fit your lifestyle now and in the future. It is important when looking to rent a home that you consider how many bedrooms and bathrooms you really need. We advise that you only look at homes that meet your criteria, as it would be a shame to fall in love with a cosy, charming home that just isn’t big enough! Also, remember that an extra bedroom is always a plus and can always come in handy as it can be used for a home office or guest room. If, like our home, the kitchen is the heart of your home, don’t settle for a home with a kitchen that just won’t work. You need to ensure that the potential rented property has sufficient work top space. It would be disastrous if you decided to rent a property, paid all those admin fees and then realised that by the time you had put your microwave, kettle, tea sugar and coffee canisters out that there was no room to prepare your Sunday dinner veg! Older homes tend to have small wardrobes and not a lot of storage space. If your like us and have lots of clothing, sports equipment, out-of-season clothes and holiday decorations, be sure you know where it will all go in your new rented home. 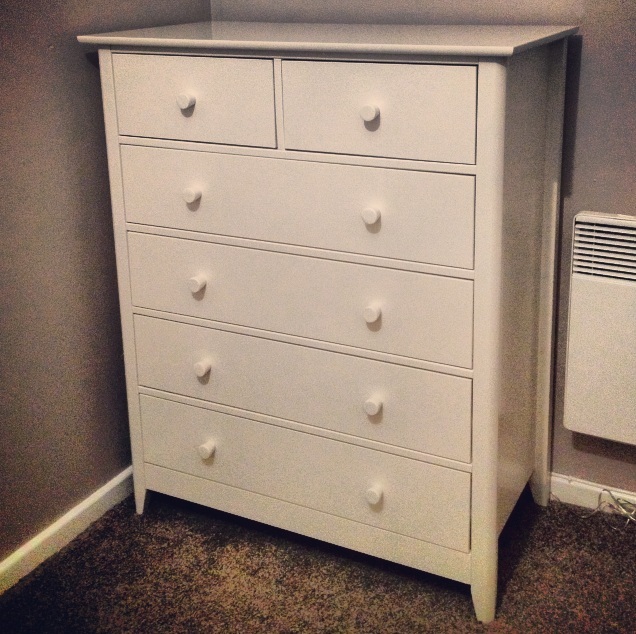 Newer homes tend to have bigger storage spaces and built in wardrobes. Remember, you can always add storage space – but this may mean you have to sacrifice living space in your rooms. The question is, do you love a bright room or do you love privacy? When looking at a potential rented home remember to keep light and sunshine in mind, as well as air ventilation. It’s no good if your a curry lover renting a home with no kitchen window! Also look at the locations of electrical outlets and fixtures – will they accommodate your lighting needs? Some times the simplest home looks spectacular because of the installation of mod cons, hardware and a possibly a fireplace. If these elements are important to you, look for them while house hunting or be ready to add them after you move in – if your landlord approves of this of course! If you keep these specific elements of a home in mind, your rented house hunting will be more successful, and you’ll likely end up with the rented home of your dreams – whether it be a house or apartment!